On Sunday September 30, Bribie Island Youth Camp was graced with a visit by His Eminence Archbishop Stylianos. His Eminence witnessed first-hand the progress on the site, which is a campus of St Andrew’s Theological College. This was his first visit since laying the foundation stone for the chapel of Panagia Theotokos, in 2001. He was impressed, not only by the idyllic natural ambience of the island, but also by the quality of design and efficiency of construction of the project which is funded by the Federal Government Department of Employment, Environment and Workplace Relations. Stage 1 of the project comprises seven cabins that will accommodate 48 guests, a Community Hall seating up to 250 people in comfort, coach setdown and car parking area. This is in addition to the first cabin, Kastellorizo House, donated by the Kastellorizian Association of Queensland. During this visit, His Eminence received an encouraging update on the progress of the project from the Bribie Island Centre Chairman, John Panaretos, and Building Committee member and Procurement Officer, Costas Stratikopoulos. He was pleased that, to date, all milestones under the funding agreement have been met. Moved by the level of dedication and efficiency shown by all committee members, His Eminence stated that this forthcoming facility belongs to, and is for the benefit of, the youth in all Parish-Communities of the Archdiocese as well as for the wider Australian community. Completion is scheduled for May 2013. In July, His Grace Bishop Iakovos, visiting Brisbane from Melbourne, made the short trip to Bribie Island, to celebrate the Divine Liturgy and lunch with parishioners and clergy from around Queensland, including a much-welcomed group from St John the Baptist Parish in Cairns. The youth camp committee is now appointing a camp manager and youth co-ordinator and taking bookings. In the interim, please contact Helen Passaris (07) 3349 7647 for any enquiries or go to our website: www.gobribieisland.org for general information. The Gillard Government will provide a $1.9 million grant to the Greek Orthodox Archdiocese of Australia to help complete the second phase of the Bribie Island Youth Campus, Federal Minister for Youth – Peter Garrett announced last week. The announcement was made during Greek Independence Day celebrations in Sydney. Funding will be provided to the Saint Andrew’s Greek Orthodox Theological College which has been developing the youth facility since 1997. 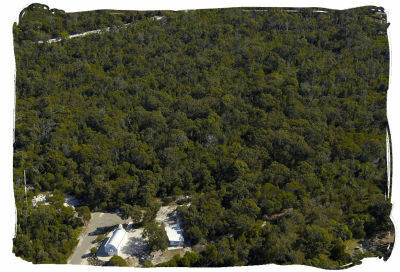 “The completion of a multi-purpose youth and community retreat and education centre on Bribie Island has been a long-held dream of the Greek Australian community since the first bequest for that purpose was made in 1971 by Brisbane man Tom Lemnos,” said Mr Garrett, adding that the community had worked tirelessly to turn Lemnos’ vision into reality. 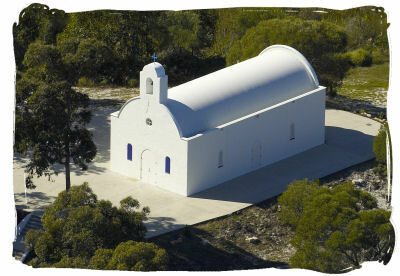 The Greek Orthodox Archdiocese was granted a five hectare Crown lease on Bribie Island by the Queensland Government in the 1990s. So far, the first stage of the development has been completed – a church and amenities block. The new funding provided by the Government will help the church complete Stage Two, which includes camp sites, a self-contained accommodation unit and a caretaker’s residence. The Bribie Island Youth Campus will be used as a retreat for young members of the Orthodox Church and will include educational, physical and cultural activities. The facilities will also be available for use by the wider community. “The Greek community has played a vital role in the development and success of Australia. The rich history and heritage of Greece has helped foster our diverse and modern society and it is very pleasing to be able to mark Greek Independence Day by providing support for such a worthy project,” said Mr Garrett. St Andrew’s Theological College, founded in 1986, is the only civilly accredited Orthodox tertiary institution of its kind in the southern hemisphere. 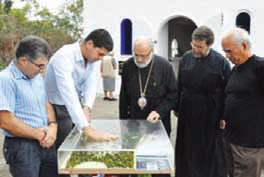 Bishop Seraphim, Sub-Dean of St Andrew’s Greek Orthodox Theological College told Neos Kosmos that the funding provided an enormous catalyst to complete the Bribie Island campus and its retreat facilities but that the funding did not take away the need for fundraising efforts on the part of the community to fully realise the project. The Bishop took the opportunity to thank the Kastellorizian Association of Queensland for their donation of the first accommodation cabin, and to express his gratitude to all smaller donors and supporters who continue to give their time and their energy to the unique Orthodox retreat. “We envisage that over the next two years, we will be able to build the auditorium, accommodation quarters and other facilities that are needed in order to hold courses on site, amidst the beauty of the natural surrounds, as well as theological conferences,” said Bishop Seraphim. Welcome to the Archdiocese’s retreat on Bribie Island, Queensland. Our site transports you back to our homeland of Greece. The white church perched on the hilltop, the sweet scent of the surrounding native bushland and the backdrop of the crystal clear, deep blue Pacific Ocean takes you back to your island village and the memories of a past era. We have managed to capture these images by replicating an “Eklisaki” on the highest point of the site. A small kitchen allows us to provide barbeque and picnic style lunches after the Divine Liturgy providing that famous Greek hospitality to all who visit. This project offers a unique opportunity to celebrate our Greek and Australian heritage. It will be the first of its kind to be built and managed by a Greek Orthodox community here in Australia. All this is part of a larger plan – to build a multi purpose youth and community retreat centre to encourage the spiritual, social, cultural and sporting development and education of our youth in an Orthodox Christian framework. The Church will be an integral part of this project. The 12 acres or 5 Ha of native bushland is only 100 metres from the beach on Bribie Island, one hour’s drive north of Brisbane via the Bruce Highway. It is fully accessible by sealed road from Brisbane and is connected to the mainland by a one kilometre bridge. The quiet island is nestled between Brisbane and the Sunshine Coast. The passage of water separating Bribie Island and the mainland is known as the Pumistone Passage, an ecological sanctuary. It is within a short stroll of the patrolled beach and the Woorim town centre commercial facilities, and within a short drive of municipal playing fields, water sports, beach 4-wheel driving and other water-based recreational activities. Stage One which includes the Church dedicated to Panagia and amenities block consisting of toilets, storage area and kitchen is complete. Stage Two will include a caretaker’s residence, 20 cleared camp sites, toilet/laundry/shower block and one self-contained accommodation unit. God willing, Stage Two will commence in 2007. Approximately forty years ago a man called Eleftherios Canellos, known as Tom Lemnos (pictured right), from the island of Limnos, had a dream about dedicating a monastery to the Panagia, to be built by the sea. The late Tom Lemnos passed away in Brisbane on 29th May 1971 and under his Will, he left his major asset, a property at Wellington Point (an outlying suburb of Brisbane over looking Moreton Bay) to the Greek Orthodox Church. The location of the bequeathed property was not suitable for the fulfillment of Tom’s dream as the local authority had indicated that it would not look favourably at any development application for a monastery. The property, under direction from the trustees, was subsequently sold and the funds held in trust, to be used for the purpose of a youth camp and retreat centre for the Orthodox Church. A Steering Committee was appointed by the Archdiocese and, as an educational centre, it was decided to bring the project under the wing of St Andrew’s Theological College and to be known as the Bribie Island Campus. In response to a request from the Steering Committee and with the assistance of the then Speaker of the Queensland State Parliament, Mr Jim Fourras, the Queensland Government granted a Crown lease of about 5Ha of land at Woorim, Bribie Island to the Greek Orthodox Archdiocese. 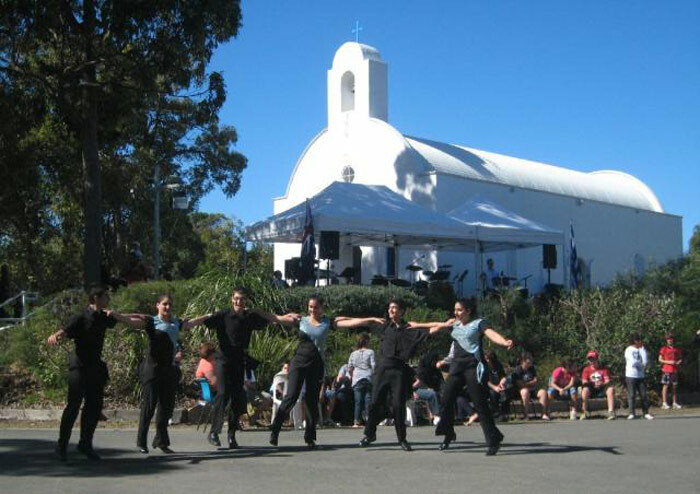 The land is currently held by the Greek Orthodox Archdiocese of Australia Consolidated Trust as lessee. The grant was conditional upon development of the site for a youth camp. The Committee appointed architect Steve Costi of Thomson Adsett Architects, to prepare a master plan for the development of accommodations cabins for 100 people with a church, a central dining and lecture auditorium, playing field, caretaker’s residence and associated facilities. The site was rezoned in 1997 and construction commenced with the installation of infrastructure connections: water, sewer, kerb and channeled road access including a creek culvert and electricity. Hence, the site is connected to reticulated water, sewerage and power and fully sealed, kerbed and channeled roads. The Bribie Island Campus project has received town planning approval and all other necessary approvals, including tax deductibility of donations. It also has the support of both State and Local government authorities. On Sunday 7th October, 2001 approximately 700 people attended the first Divine Liturgy followed by the laying of the foundation stone by his Eminence Archbishop Stylianos. The Divine Liturgy was celebrated out in the open under enormous marquees. Buses from the four Parishes of south-east Queensland ferried the faithful to the site. Construction of Stage One commenced in 2002 (pictured left) and the first Divine Liturgy in the Church was held on 24th September 2003. Later that year, on Sunday 23rd November, the 8th Queensland State Youth Conference was held. Sunday and weekday Liturgies are held regulary with the assistance of the parish priests from Brisbane. Greek Community associations, Ladies Philoptochos and senior citizen groups together with Orthodox youth groups use the facilities. The bi-annual Bribie Island Sports Challenges with the youth from the Brisbane Greek Orthodox parishes have become very popular. These events provide a spiritual, educational and social as well as a sporting experience for the youth. To date the funds held in trust from the late Tom Lemnos Estate have been used to fund the infrastructure requirements and Stage One of the project – a Church dedicated to Panagia and an amenities block – toilets/storage/kitchen. Fundraising is now under way in order to provide the necessary financial resources for Stage Two of the project which will include a caretaker’s residence, 20 cleared camp sites, toilet/shower/laundry block and one self-contained accommodation unit.